U.S. Electric Mfg. Corp. (1920-1960's) This gallery is now featuring the USALite swivel head flashlights, and a few other kinds of redheads. I moved the USALite redhead flashlights to another gallery, located on the right side menu. You'll see six different swivel-heads in this gallery. I'm missing one that we just don't see come around. That's the green ceramic swivel head. I have the one with the red ceramic shown below. So that means there's at least seven swivel-heads so far to be found. Not all the swivel heads came with the name plate, same goes for the ring hanger, some had'em and some didn't. You'll also see a hard to find green swivel-head below, with the box, which is really rare to find. 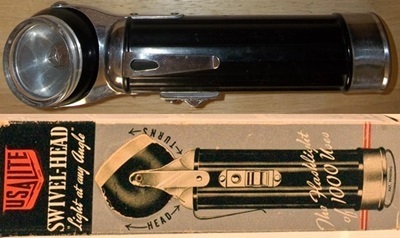 The box shows the black swivel-head with the chrome end cap, same as the black/gray box. 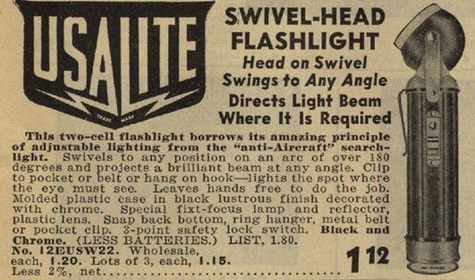 Maybe they used only the black swivel-head with the chrome end cap, pictured on the boxes for the swivel-head flashlights. If you're a fan of the USAlite swivel heads, you might want to read an interesting article about the on going debate as being a GM accessory in the Collectors Corner. Move your mouse pointer over any image to view an enlarged photo and a short description.